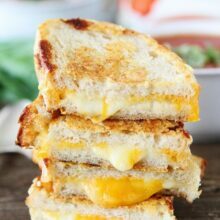 Three Cheese Grilled Cheese-this triple cheese grilled cheese sandwich is perfect for dunking into a warm bowl of tomato soup! This week, it was chilly outside, so I made Three Cheese Grilled Cheese Sandwiches and Tomato Basil Soup for lunch. Caleb was excited when he heard what was on the menu. 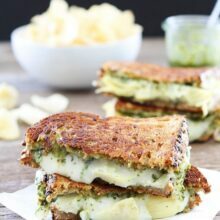 He loves grilled cheese sandwiches and this one is loaded with cheese! 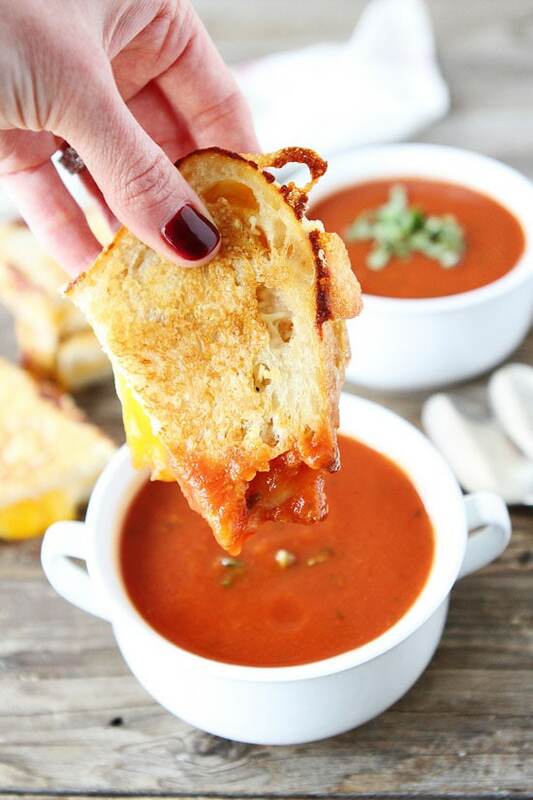 Grilled cheese sandwiches and tomato soup are a match made in heaven. They belong together! I love making homemade tomato soup, it’s so good with grilled cheese! While Caleb is at preschool, I am busy getting my work done and spending time with baby Maxwell. The three hours always go so quickly. When lunch time rolls around, I need something fast. I don’t want to keep Caleb waiting when he gets home! 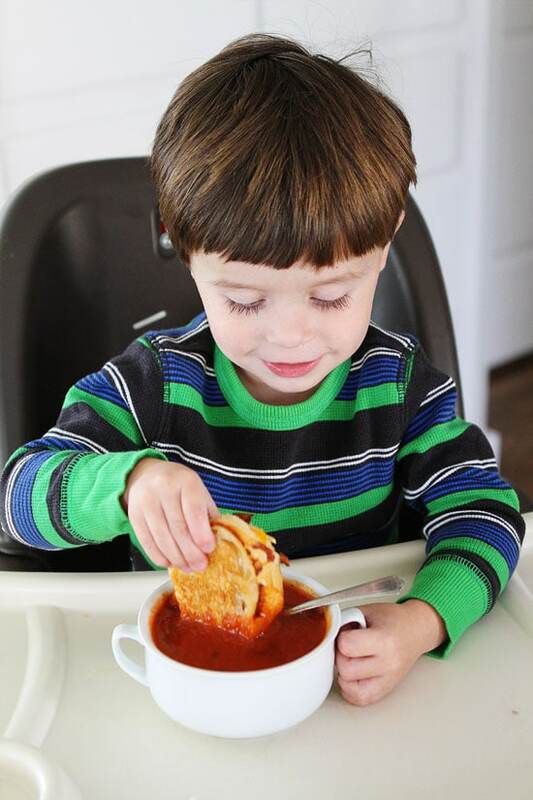 Tomato Basil Soup was the perfect soup to go with our Three Cheese Grilled Cheese Sandwiches. For the sandwich, I used cheddar and mozzarella cheese on the inside because they are Caleb’s favorite. I coated the outside of the sandwiches in Parmesan cheese. I love the salty, cheesy crust makes the sandwiches extra special. You can’t go wrong with more cheese:) That is what the sandwich is all about! I can see a lot of Three Cheese Grilled Cheese Sandwiches in our future. 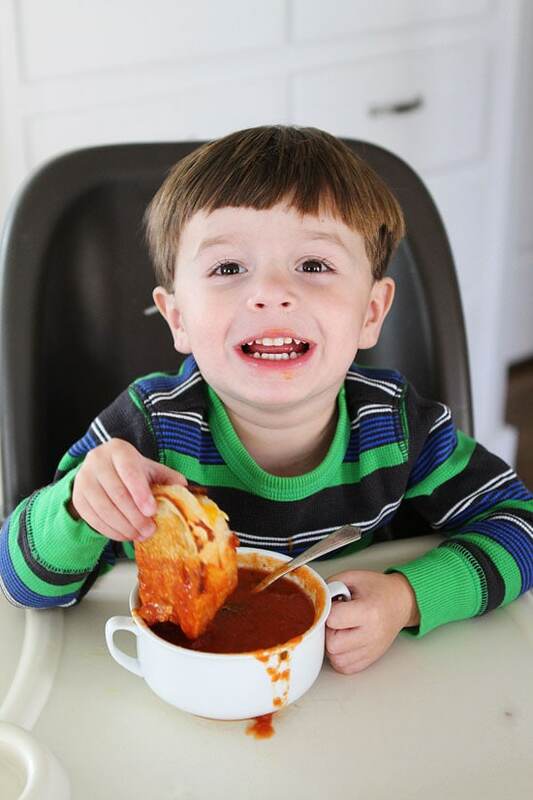 There is nothing better than a grilled cheese sandwich and a warm bowl of tomato soup on a cold day, especially when you are eating it with your loved ones! Caleb is already asking for more grilled cheese PLEASE and I am more than ok with that. Bring on the comfort food! This grilled cheese sandwich has three kinds of cheese: cheddar, mozzarella, and parmesan. Serve with tomato soup and you have a comforting meal! Spread the butter on one side of each bread slice. Add a slice of cheddar and a slice of mozzarella on each piece of bread, then cover with another bread slice, buttered-side up. 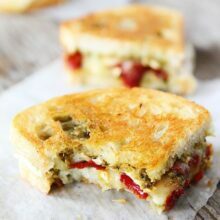 Sprinkle Parmesan cheese on the outside of one side of the sandwich. Heat a large skillet over medium heat. Place the sandwich, cheese side down, on the hot pan. Grill for 2 minutes or until Parmesan cheese is crusted and golden brown. 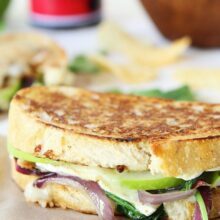 Sprinkle Parmesan cheese on the outside of the other side of the sandwich. Cook until golden brown and the cheese has melted, about 2 more minutes. Serve immediately. Love this – looks fresh, easy and delicious! 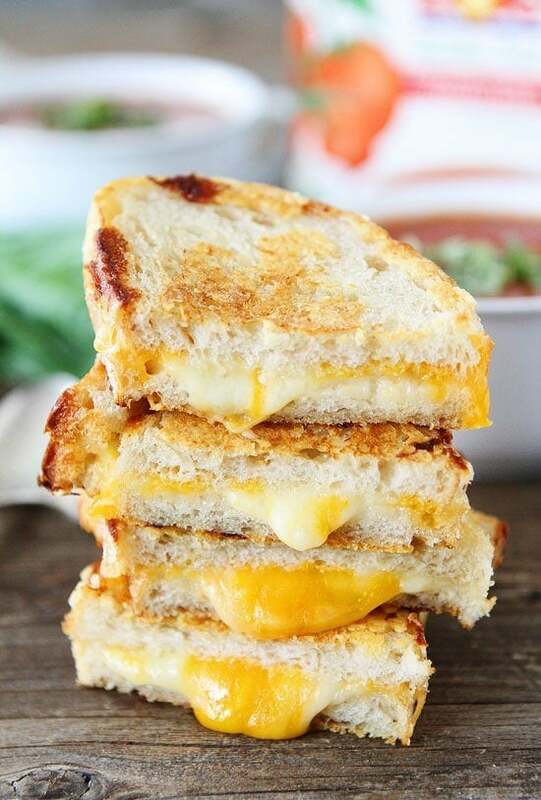 I am dying for grilled cheese lately. I have one at least twice a week. Caleb is such a cutie! 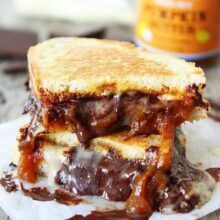 And Maxwell too of course 🙂 This grilled cheese looks so delish! One of my favorite sandwiches. I will have to try this Dole soup soon. It looks tasty! Love grilled cheese sandwiches and never thought of making it out of sourdough. Mine is always so flat. Will try this for sure. Haven’t had a grilled cheese sandwich in too long! Looks delicious! The soup must be a new product and no our little store does not have it. Will have to look somewhere larger when I see a doctor. I think it’s genetic that we all love toasted cheese sandwiches and soup—-and that love starts out early in childhood. I still love the combo. In fact I was going to just have a bowl of cereal for dinner, but after seeing that sandwich and soup I am charged up with that instead. I got so caught up in thinking about my own dinner and toasted cheese that I didn’t mention that is one cute kid. His eye lashes in that one shot—wonderful. That grilled cheese sandwich is mouthwatering. Also, I love the idea of dunking it in tomato soup. Delicious! Thanks for the recipe. I so need a grilled cheese and bowl of soup right now! An improved classic, hard to go wrong there. Sandwich this week for sure. Alas, I have been getting coupons for these soups for about 2 months, but the product doesn’t seem to exist here. Bummer, that looks good too. 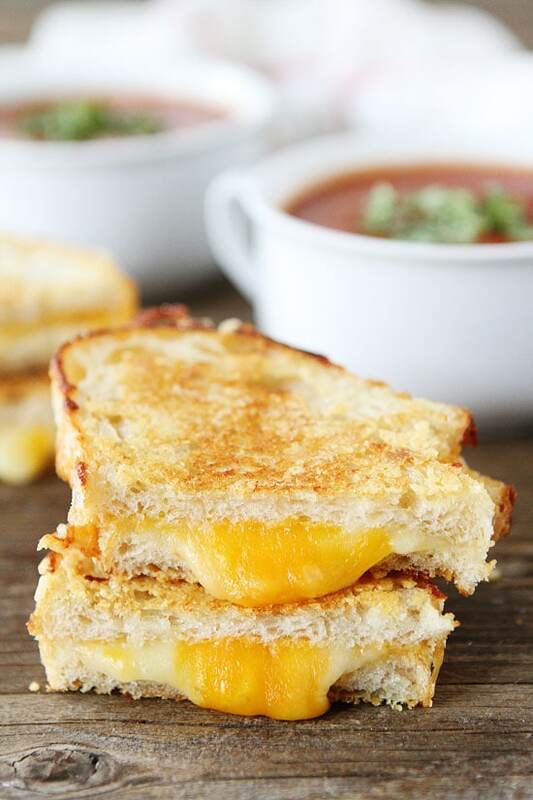 What could possibly be better than grilled cheese? You found it! today i have a mood of soup i’ll try your recipe..